People exposed to high altitudes often experience somatic symptoms triggered by hypoxia, such as breathlessness, palpitations, dizziness, headache, and insomnia. Most of the symptoms are identical to those reported in panic attacks or severe anxiety. Anxiety and altitude correlate. Or so the studies say. Paradise syndrome is a, non-recognised, psychological disorder that presents itself as a deep depression in circumstances when the sufferer should be perfectly happy. The only thing I could do to test this theory was to take my own, anxiety compromised, body to altitude and see for myself. I asked my doctor if being anaemic could impact how I felt at altitude: I didn’t ask how it would affect my mental well-being. 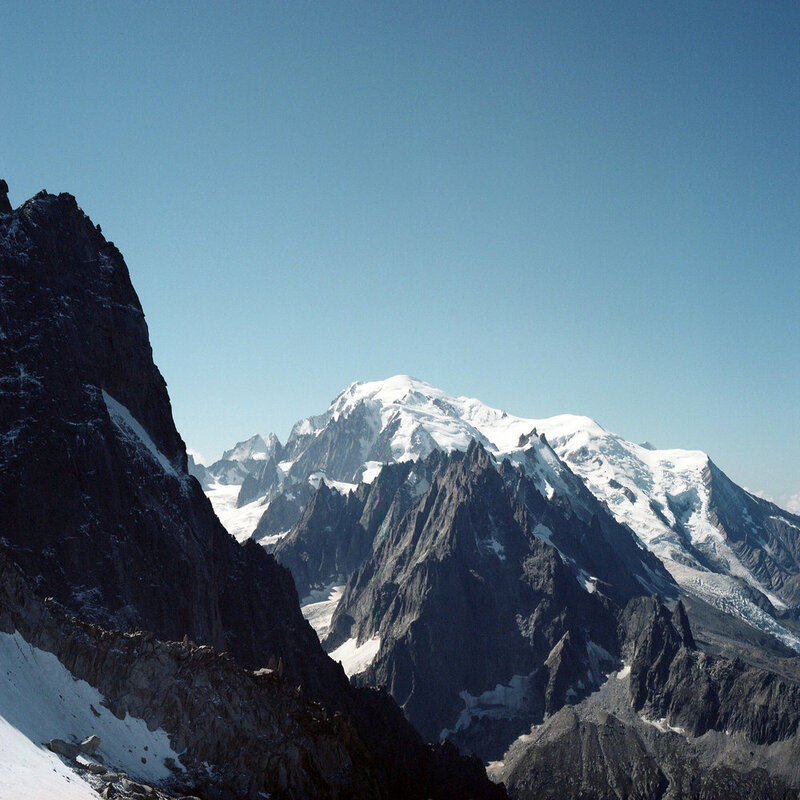 Excerpts from a Chamonix altitude diary. at 64 beats per minute. I could breathe. My childish sense of humour still made me laugh. Where did you attend university and what year did you graduate? But here I am, sitting at the table in our apartment for the week and I can’t breathe. I just feel like I’ve inhaled a bonfire. Most of all, I’d like to be able to leave my breathing to my body which, apparently, it is supposed to know how to do all by itself. I can’t eat more than a cracker at a time without the threat of freshly chewed crackers adorning the toilet bowl. But lack of food is a good enough explanation for the dizziness. And it has been louder than the physical desire to smash my head through the nearest window. What are some standout moments from your time at university? Being taught photographic theory by Liz Wells at Plymouth was an exceptional experience that really solidified my, already prevailing, interest in the photograph as something that is more than one makes with a camera. Which photographic genre do you consider your work to fall into? This is a question that has always eluded an answer for me. I make personal work that is usually either to do with the materiality of the medium, or that is based on theories and ideas that might be from personal experience or that of others, or a combination. I don’t focus too much on fact or fiction; they’re both in there somewhere. I think it’s up to the audience to categorise my work for me. What themes do you find yourself exploring? Psychologies, myth, place-making, womanhood, being human, escapism, too much introspection, quite a bit of voyeurism, are all themes that a recurrent in my work. I’m mostly obsessed with other people and the stories they tell. Much of the introspection is figuring out my own story and making sure it’s interesting…even if this includes fictions. Although there isn’t much portraiture in my work, this is something I’ve been working on. I like making portraits when I find people are speaking about something interesting, as opposed to making someone sit still and silent for me. How did the idea for this series come to the surface? Did you always intend for it to be so personal? I knew I was going to be spending a week in Chamonix making work, but I didn’t have a particular agenda. Some of my more recent work has been focused on landscape, particularly mountains and being in the wilderness, and I knew there would be mountains in Chamonix, but I didn’t consider that this situation would completely alter my perspective on them. I have spoken about mountains previously as being arbiters of quashing my anxiety, allowing me to escape everyday life but, on this occasion, probably because of the altitudes I was working in, the anxiety was exacerbated and the mountains became much mightier than I could have imagined; more terrifying than sublime, as I have previously experienced them to be. I almost never intend for work to be personal, yet it usually turns out to be. General Anxiety Disorder is a pain. I am not worried. I’m lying. I am worried about death and that doesn’t mean of poor old me. I miss my family, but that makes me sad, not anxious. Or maybe it does make me anxious. Are you trying to tell me I’m full to the top with anxiety, and scared to leave the house, because I don’t want anyone I love to die? How very rational. Were you influenced by any photographers in particular? I don’t really draw inspiration from other photographers – my inspirations come from people, stories, and experiences. That said, my favourite photographers are those who tell stories, either of their own lives, or of others’, so I might be subconsciously inspired by them. What have you learnt about yourself making this work? I’ve mostly learnt that I do follow a specific methodology in making work, even if I don’t intend to, which I am learning to embrace and enjoy. The more work I make, the more it becomes clear to me that I don’t always need to research as much as I often do, so that when an opportunity presents itself, I can be comfortable knowing that I’ll be able to make something out of it. Seems an alright thing to say on paper. The worst thing is, I’ve admitted it to Bob, this stupid ‘condition’, but I can’t admit it to anyone else. Would anyone else help? Who stands in their house, shaking like a chilly Chihuahua just to take the intrepid expedition, literally around one corner, to the corner shop? Who needs to know the location of the nearest W.C. at the final destination (and all those in-between?). I don’t want to be so anxious about doing normal, everyday things. I am brave. Maybe not brave in the usual sense. Like going to the corner shop. But I went up a 3300 metre mountain in two cable cars after getting a train just two days ago, by myself. Now I’m exhausted. Was it the altitude or my attitude? Even if it was my attitude, you think, I wanted to go and I enjoyed it, in-between the breathlessness and loss of vision as we climbed higher and higher in the cramped cable cars. To be a futurist is to be anxious. I will be anyone’s safe hands. Maybe I need some safe hands. What equipment did you use? Were your choices important to your way of working? I solely used a Hasselblad 500C/M with expired Portra 160 film from 2014. I have a small selection of cameras that completely change my method of working, depending on which one I use. I wanted the visuals in this project to be formal and I make my most formal work with the Hasselblad. It makes me work more thoughtfully and it isn’t as cumbersome as a 5x4 field camera, which would have been too heavy for me to carry around all day whilst wandering. I’m going to stop writing soon because even this is worrying me. That’s right. Sitting at the table in a nice, cosy apartment. Belly ache. The text that accompanies your images is thought provoking in terms of our own mental health and wellbeing. Was it your aim to approach people in this way through your work? I always write when I’m working on a project, sometimes quite unrelated (I think!). 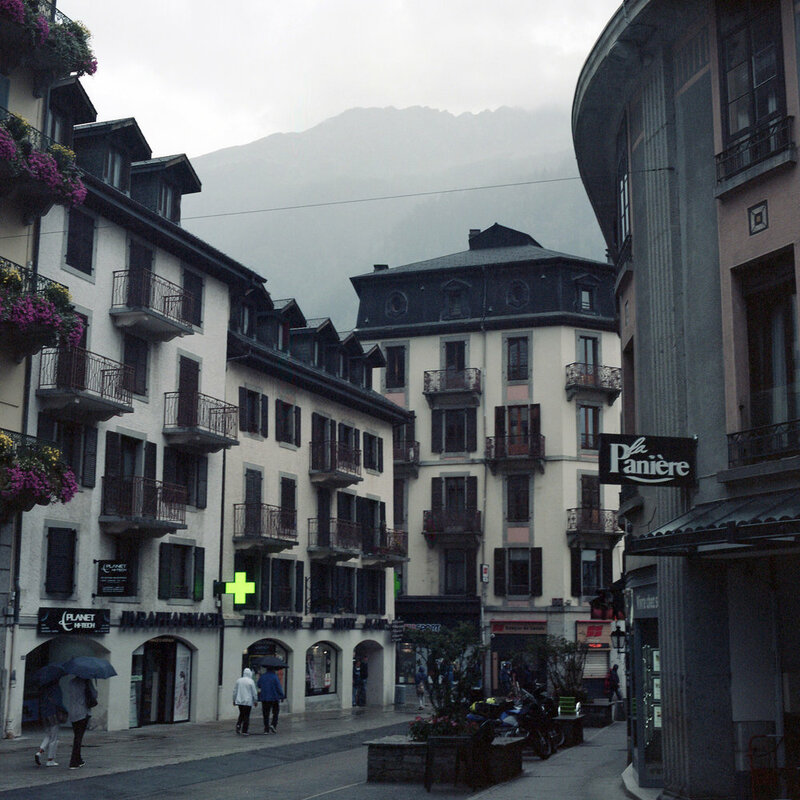 This time I wrote some pieces about people I met while in Chamonix as well as a diary. I don’t usually keep a diary, so I just sat down each day and started writing whatever came to mind, stopping when I ran out of words. It wasn’t my aim to go to Chamonix and think about mental health at all. I fully expected to return with some nice pictures of mountains, because I hadn’t really planned what else I would see or experience. Fortunately, in terms of giving me material to work with, I didn’t feel great at altitude so I started looking into altitude and mental well-being and found some really interesting resources for example, studies on how suicide rates are higher in mountainous regions in North America which speculate whether altitude is the culprit vs. the way of life. It just got me thinking. Tell us more about how you made these images. What were your thoughts and feelings at the time? The only self-imposed prerequisite to my time in Chamonix was that I had to travel as high as I could without going full mountaineer. 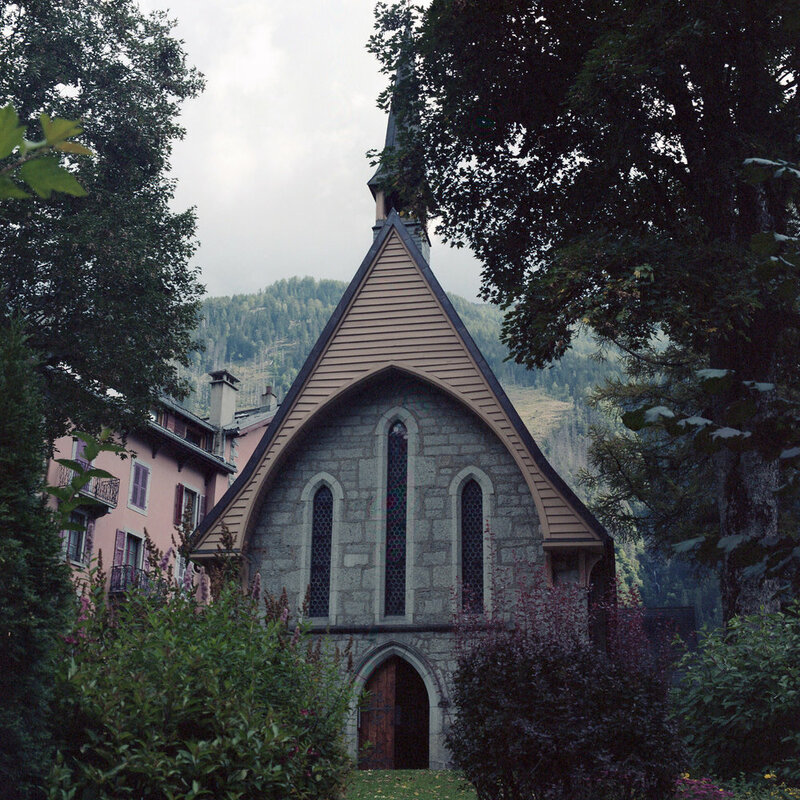 I did research into which lifts, trams, and trains, would get me close to the highest peaks along the valley before I travelled, then while I was there I looked into where I might find specific locations I often look for, like churches, as signs of refuge. I spent most of my time walking and exploring and, at first glance, Chamonix caters for tourists, so wandering off the beaten path was essential: I got lost in the woods when I couldn’t find a bridge to cross a river. The best day came towards the end of the week when it torrentially rained and I was one of only a few people outside. I walked around for hours observing and thinking, feeling a bit downcast but actually enjoying it. I enjoy those days because I think it’s when how I feel correlates the most with the images I make. Are you able to look at this work objectively or do single images bring back really specific memories? I can always look at my work objectively, I think, after I’ve put a finished body of work together and it becomes separate to me. My tip for myself to allow the images and writing to distance themselves, and for the work to begin to become objective, is to scan the films, make test prints, type up anything that needs typing up, then just put it away for a week, if I can go that long. I try to do this with most work I share because, in the moment, something I’ve put together can seem really finished, then I’ll look at it the next day and notice something I’m not happy with. I think it’s a form of catharsis: have the experience, get the work made, tell your story, then put it away. Is there a particular image from your series that stands out to you more than any others? If so, why? If I think about it, the small church is a stand-out image, simply because I had to creep through someone’s garden to make it. 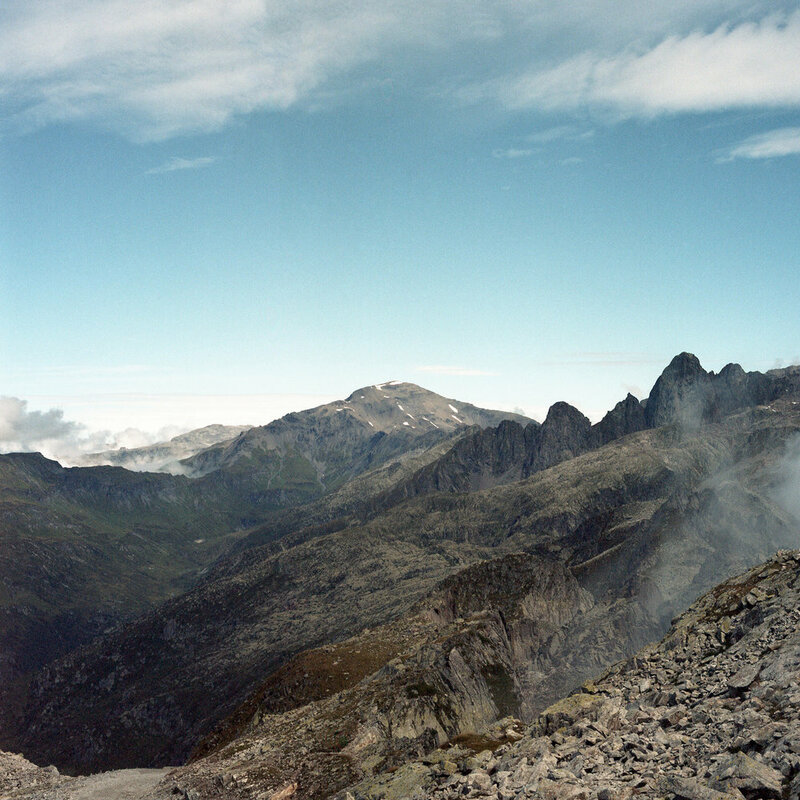 The images from this project do carry more negative connotations for me than usual, I think because for most of them I was still rattling from having disembarked a cable car just before I made them. And I meant, to whoever controls this idiotic panic, ‘don’t make me panic, I’m not worried about this at all!’ So, the Superhero that hasn’t quite got a grip of her powers yet. I’d rather be shooting webbing out of my wrists at unfortunate moments. Or perhaps an uncontrollable urge to get changed in a phone box. This will do, I suppose. I think I’ll go back to my safe place. Wrapped in blankets. Duvet protection. Stop being scared of my own bloody reflection. What are your future plans? I’m still applying for funded PhDs and recently had an interview for a lecturing position; I came second. I might bite the bullet and go for a self-funded PhD but I would prefer sponsorship! Other than trying to get ahead, I’ll just be here, making work.